The noble aim for the artist of the Gupta period was to create a human form that rose above itself. VISHNU, MATHURA, 5TH century (Government Museum, Lucknow). This tranquil deity expresses the harmony and purity of the natural order. IN western India, from the 2nd century B.C. to the 2nd century A.D., there was a prolific creation of art in caves hewn out of rock. These presented the human form at its most vital and robust: full of life force and the fertility of nature. These depictions continued in many ways the spirit of the Yakshas and Yakshis of earlier times, who personified the abundance and protection of the natural order. In the meantime, another manner of depiction of the human figure was developing in the eastern Deccan, in the Buddhist sites of the Krishna Valley. These had a languorous grace, and an introspective look had begun to come upon their faces. We find extensive examples of this sophisticated style of art from the 2nd century A.D. onwards. Before this, art brought to us the vital and living world of nature, in which man was only one part of its existence. Now the focus shifted more to human forms, and some of the joy and frolicsome world of creation was left behind. Meanwhile, in northern India, in A.D. 320 Chandragupta I founded the Gupta empire. His capital was at Pataliputra in present-day Bihar. He ushered in an age of well-being and prosperity, an age in which all aspects of culture flowered. It was one of the finest periods of mankind, when great thinkers attained noble heights of achievement. The period of Gupta rule, often called a “Golden Age”, lasted up to A.D. 467. Kalidasa, the greatest Sanskrit poet and playwright of all time, lived during this period. As did the astronomer and mathematician Aryabhatta, the first person to calculate accurately the solar year. Fa Xian, the Chinese pilgrim who visited India at this time, wrote about the liberal rule, light taxes and the well-being and prosperity of the people. 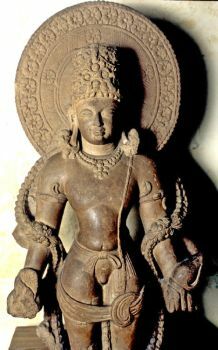 ANANTASAYANA VISHNU, DEOGARH, Uttar Pradesh, c. A. D. 500. In his deep slumber, Vishnu dreams the world into existence. He reclines upon the serpent Sesa. In the 1st century, deities in Indian art had been created in human form. The belief was in the oneness of all that there is. The world of separated forms was considered to be an illusion. In the search for the Truth, the veils of illusion had to be lifted. Forms of deities were created to provide a support to minds that could not comprehend the formless abstract. These forms were many, all different aspects of the one, formless Truth. All paths led to the same goal. The challenge for the artist was to present human forms that did not divert one’s attention to the ephemeral world or bind one to it. The noble aim for the artist of the Gupta period was to create a human form that rose above itself. It was not a human being who was caught in the web of the material world. It was an embodiment of that which was eternal, that which was undisturbed by turmoil and cravings. Meditating upon such a form, devotees awakened the best within themselves. They rose above the pains created by their own desires and confusion. Indic deities are reflections of the best qualities that are within us: the peace, the joy, the sublime stillness. These deities are aids to our inward journey. Mathura, on the banks of River Yamuna in North India, had been a great centre of art since the Sunga period in the 1st and 2nd centuries B.C. By the 1st century A.D., some of the earliest images of Indic deities were made here out of the local red sandstone. By the 5th century A.D., the figures carved here had become slender, and there was a delicacy of treatment. A look of tranquillity had come upon them. Garments were indicated by a series of folds, yet they did not hide the graceful bodies beneath, which were the manifestation of the ideal state of being. DOOR JAMB, SARNATH, 5th century (Archaeological Survey of India site museum, Sarnath). Indic art does not strive to convey photographic reality. Instead, it depicts the grace that is inherent in all creation. It is this grace that meets one as one proceeds into the temple. Mathura had long interacted with Sarnath, on the banks of the Ganga. It was at Sarnath that the Mathura tradition flowered beautifully in the Gupta period. Here, the form was created to express the spiritual state of the Buddha, one who has left behind the turbulence of the material world. Three standing Buddhas, one of A.D. 474 and two of A.D. 477, are fine examples of the achievement of Sarnath. In these, behind lowered eyelids, the look is within. The mind is not disturbed by the illusions of the passing world; it is still. It is not the conquest of the world but the conquest of the mind that is the theme here. All that there is, is One, and it is to be found within, in the endless peace of the mind. Such an art was not concerned with outward ornamentation, and the apparel all but disappeared. The folds of the garment were gone and the forms of the body were clearly visible. The smooth planes of the body blended effortlessly into one another. A form had been given to bliss itself. It was unmarred by the blemishes and imperfections of ordinary mortals. Inscriptions state that these were made beautiful through the science of chitra, or art-making. It is around this time that Chitrasutra, the oldest known treatise on art, was penned out of traditions that were ongoing. In Indic art, the emphasis was never on individual problems and their solutions. The best and distilled knowledge of the finest minds was passed down and modified constantly. GAJENDRAMOKSHA, DEOGARH, UTTAR Pradesh, c. A.D. 500. The story of Vishnu saving Gajendra, or elephant, can be seen on the north wall of the temple. The elephant, seized by a serpent, appealed to Vishnu. This is also the story of misguided intellect caught in a web of maya, or illusion, until it is saved by true knowledge. Canons guided the artist. Individual achievement and works of rare beauty were born out of the immediate experience of reality itself as visualised by the artist. A seated Buddha of this period, of the Sarnath school, is depicted preaching the First Sermon, at Sarnath. He is seated in the yogic posture of meditation, seen in Indian art from the time of the Indus Valley civilisation. His hands are in the dharmachakrapravartin mudra, indicating that he is setting into motion the wheel of dharma, or law. The chakra, or wheel, is also seen below, as are deer, indicating that the scene is set in the deer park at Sarnath. On both sides there are leogryphs, symbolising the regal roar and the authority of the Buddha’s message. These became a constant feature in Buddhist art from this period onwards. At Sanchi, new temples and additions to old ones were made in the Gupta period. Four Buddha statues were placed at the entrances of the Great Stupa, in the mid-5th century. As in other depictions of this period, in these sculptures, the Enlightened One personifies an inner calm, which the noise and confusion of the material world cannot disturb, where the armies of Mara have failed. The only true victory is that over the restless mind, the mind that darts about and will not be still. The mind has been brought to look upon itself and be fully occupied. In the first quarter of the 5th century, 20 caves were carved out of the hill at Udaigiri, not far from Sanchi. These rock-cut caves are the earliest surviving Hindu temples. A temple was conceived as a home for the deity. One leaves behind the mundane world to enter the peace and dark of the interior for darshan. Looking upon the deity, who is made to convey the eternal concepts, one awakens the best within oneself. One is graced by the act of seeing the deity – that is darshan. It is a concept that is central to Indic thought and continues until today. SIVA AND PARVATI, Nachna, Panna district, Madhya Pradesh, 5th century A.D. (Tulsi Archaeological Museum, Ramavan, Satna). Deities in human form are created to help us relate to the divine. They display emotions and have relationships, as we all do. They are aids to the realisation of the divinity that is within us. It is only at Udaigiri that one can still see the context in which Hindu deities were created in the Gupta period. Though these are the earliest remains, it is clear that both iconographic and artistic concepts had already been formulated. It is also known that the earliest images were made in wood and other ephemeral materials, which have not survived. 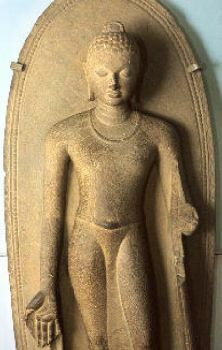 DIKPALA, BHUMARA, MADHYA Pradesh, 5th century (National Museum, Allahabad). Dikpalas are the guardians of the directions and were made on the outer walls of temples. In their majesty and strength, they keep the evil forces of confusion away from the sacred interior. The most magnificent representation at Udaigiri is of the Nar-Varaha avatara of Vishnu, with the body of a man and the head of a boar. In this story, Vishnu appeared in the form of a boar to save the earth goddess Bhu Devi. Indic religious myths of deities operate at several levels. Besides the story of the rescue of the goddess from the waters, this is also the depiction of the saving of mankind from the ocean of ignorance. The bas-relief measures about 22 feet by 12 feet (6.71 metres by 3.67 m) and is second in size only to the (so-called) “Descent of the Ganga” relief at Mamallapuram in Tamil Nadu. From the Gupta period onwards, the Varaha avatara became one of the most popular themes in sculpture. The Udaigiri depiction is a unique presentation of the details of the myth. Water is depicted with incised wavy lines and rows of lotuses. The personification of the ocean is shown and on the side walls there are female deities who represent the rivers Ganga and Yamuna. They carry forward the tradition of the Yakshis. On the right side of the relief, Cave 6 presents an elaborate carved doorway. Seen for the first time, this feature became a part of the many caves soon to be made in the Deccan and in the temples of this period. NAGARAJA, 5TH CENTURY A.D. (National Museum, Allahabad). Nagarajas are among the earliest images of Indic art of all faiths. This image has a deeply inward look, which is the hallmark of the art of the Gupta period. Amid the ceaseless activity of the illusory world, all that really matters is to be found within. Ganga and Yamuna are depicted in the upper parts. On either side of the doorway there are Dvarapalas, or guardians of the doorway. Their muscular bodies and diaphanous garments display the early Gupta style. The sculptor shows a fondness for decorative details such as bow-ends and swatches of drapery. As one approaches the door, to the left is Ganesha, the elephant-headed deity, a feature seen in the Hindu temples that follow. Two representations of Vishnu can be seen on the façade. The one on the right has personifications of his attributes. The mace symbolises the power of knowledge and the chakra stands for the universal mind. Vishnu wears a high crown and a varamala, or garland of the forest, which emphasises his ascetic nature. The iconography of the Mahishasuramardini was fully created by the 1st or 2nd century. She is Durga destroying the demon buffalo, or Mahisha. She has 12 arms to indicate her superhuman powers. Her defeat of the demon buffalo is the victory over the world of maya, or illusory forms. It is the defeat of Death, in fact, of the cycle of life and death. An ekmukhalinga, or one-faced linga, is enshrined in Cave 4. The simple treatment of the face and of the locks of hair places it in the early 5th century. The image portrays the unification of the creative energies of the world with the intellect. Halfway up the Udaigiri hill is a Jaina cave. This has a free-standing portico and the appearance of a typical small Gupta period shrine. Eighty kilometres northeast of Sanchi is the site of Eran. It has a column dedicated to Vishnu, with Garuda figures, surmounted by a chakra. An inscription states that it was dedicated in A.D. 485 by a local king and his younger brother. BUDDHA, SARNATH, 5TH century (ASI site museum). Behind lowered eyelids, he looks within. All the noise and confusion of the world appear to fade away as one looks upon the tranquil face. The deities of Indic art were aids to meditation, to help one on the path towards the Truth. It also has a giant representation of the Varaha avatara, fully in the form of a boar. The inscription of the year A.D. 500 mentions that the Hun leader Toremana was now the overlord instead of the Gupta king mentioned in the earlier inscription. This is the earliest and largest such representation of the Varaha in this form. The body is covered with rows of miniature figures, perhaps representing the sages who took refuge in his bristles. Another Varaha from Eran, of the early 5th century, is reminiscent of the Udaigiri representation. The power of the deity is expressed in the strong and full body forms. Another splendid image from Eran is of Narasimha, which is Vishnu with a lion’s head. 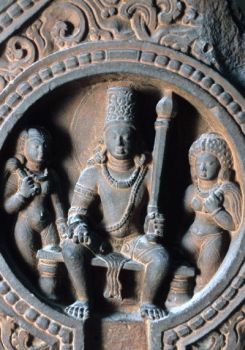 A life-sized Hari-Hara of the early 5th century presents Siva on the proper right and Vishnu on the proper left. The Indic view of ultimate oneness, in spite of apparent dualities, is expressed here. The largest free-standing sculpture of this period is of Krishna holding up Mount Govardhan. It is about six-and-a-half feet (2 m) high and belongs to the early 5th century. At the end of the 4th century, the Guptas extended their rule to include parts of Rajasthan and Gujarat. The sculptures found at Shamalaji in Gujarat convey the Gupta idiom, with rich regional variations. A four-armed Siva presents a languid grace and a sophisticated style. 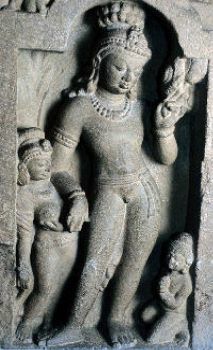 There is a depiction of Skanda with a rooster in one hand. A Chamunda is among the finest works of Shamalaji. The severed head in her hand indicates Hellenistic influences. VARAHA AVATARA, UDAIGIRI, Madhya Pradesh, early 5th century A.D. The magnificent Varaha, or boar, incarnation of Vishnu, embodies his great power. It is with this strength that he saves mankind from drowning in the ocean of ignorance. This colossal figure depicts his vigour and might. At Deogarh, near Jhansi in Uttar Pradesh, stands one of the earliest surviving structural Hindu temples. It is dedicated to Vishnu and dates to about A.D. 500. The temple faces west and has an elaborate doorway. As compared with Udaigiri, the lintels and door jambs here have multiplied. There is a profusion of foliated designs; mithunas, or loving couples; and guardian figures. The river goddesses Ganga and Yamuna have been made on the top left and right of the entrance. 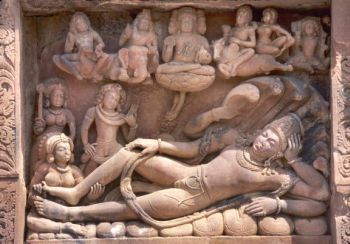 Vishnu is at the centre, seated on the coiled body of a serpent. On three sides of the temple are niches, which depict different avataras of Vishnu. On the south face is the Anantasayana Vishnu, who reclines upon the serpent Sesa, which means remainder. The serpent is also called Ananta, or endless. Vishnu’s wife, Lakshmi, massages his feet, personifying the concept of bhakti, in which the devotee gives himself over in adoration of the divine. Above this, Brahma, born out of the navel of Vishnu, signifies the creation of the world of forms. Below are the demons Madhu and Kaitabha and the personified weapons of Vishnu, who keep the demons in check. On the east wall of the temple are Nara and Narayana, incarnations of Vishnu, who bring the message of divine love and bhakti. They are the sons of dharma, or righteousness, and ahimsa, or non-violence. They are shown as ascetics. On the north wall of the temple is the story of Gajendramoksha. The Gajendra, or elephant, was seized by a serpent and a tug-of-war continued between the two for a thousand years. Finally, the elephant appealed to Vishnu, who saved him. It is the story of misguided intellect caught in the web of maya until it is saved by true knowledge. 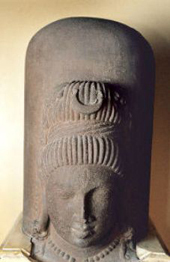 EKMUKHA SIVALINGA, KHOH, Madhya Pradesh, 5th century A.D. (National Museum, Allahabad). The Sivalinga, one of mankind's most sophisticated symbols, represents the concept of the formless eternal taking on the innumerable forms of the world. Large numbers of brick temples were made in the Gupta period. Owing to the fragile nature of the material, almost all of them have been destroyed by the passage of time. 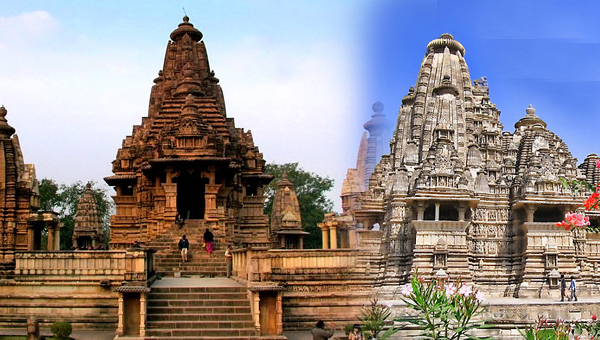 The sculptural decoration of these temples was carried out in terracotta. 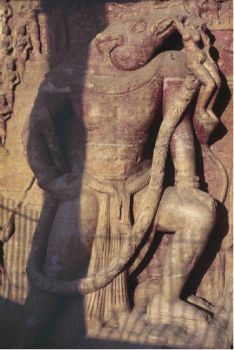 A life-sized Ganga, from the Siva temple at Ahichhatra in Uttar Pradesh, is a fine example of such sculpture. The sublime images of the best of Indic art were created out of devotion and a stillness of the mind. The desire or the ambition to create a great work of art was tempered by the understanding that this too, after all, was a lila, a dynamic play upon our minds of the world of illusion. MAHISHASURMARDINI, BHUMARA, MADHYA Pradesh, 5th century A.D. (National Museum, Allahabad). The buffalo demon represents the evil of ignorance, which is the impediment on the path towards the Truth. Durga, who represents the force and vigour within one, slays this demon. The majesty and stillness upon her face, even while she vanquishes the buffalo, are remarkable. The vanity of achievement in creating the art was subdued by a consciousness of a greater reality, in which all this was a passing maya. It was not just the works of art that were ephemeral; the deities, too, were but a path towards the Truth. They prepared and brought us a little closer to being able to comprehend the Truth, which is, finally, of the oneness of all that there is…. It is beyond form.